Bring the book and your student ID card to the Self-check machine and check it out personally. Our friendly staff at the circulation counter will help you if you had any problem. To renew online, log in to your library account. A loan can be renewed once (1 time) and renewals must be done at least one day before the due date. Please note that the new loan period begins from the day of renewal, not from the original due date. The item has already been renewed once. The item has been requested for hold by someone else. Loaned items must be returned via the Book Drop Machine. The Book Drop Machine is open 24/7 days a week. Please return your items on or before the due date or time. You may request to place a hold on the item if I an item that you require is currently on loan (borrowed by someone else). Requests for hold must be placed online via the i-SCAN. 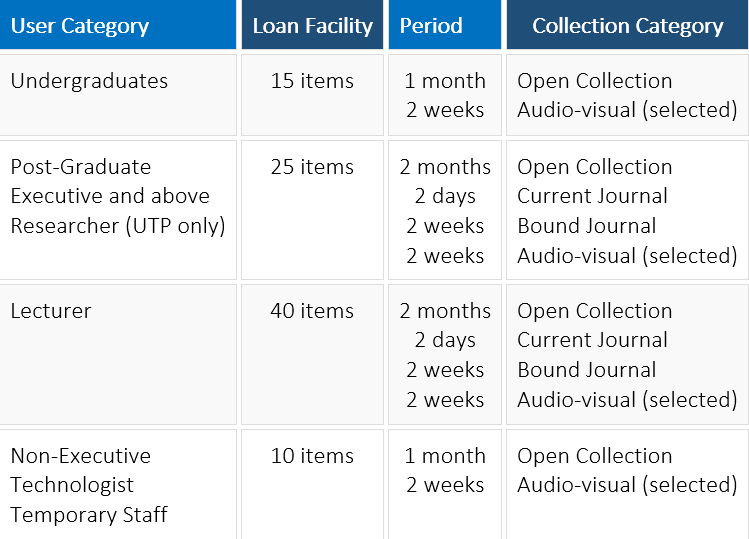 Note: You can only place ‘Holds’ for items that are on loan and not available. Items with the status ‘Available’ cannot be requested. If you have a problem to return your borrowed item on time, you will have to pay RM 0.20 per item per one day. Please make a payment at our circulation counter in IRC. only the physical information and metadata can be retrieved by public users.